Qc5+ wins trivially. 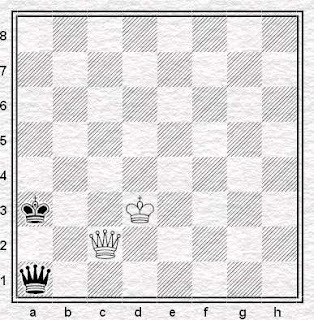 White will check Black until he forces Ka2 and then Kc2 wraps it up. Black can`t escape along the first rank or a Qd2 & Qc2 will mate and he must stay close to the BQueen or will lose it to a skewer. 1. Qc5+ Ka2 2. Kc2 Qb2+ doesn't quite "wrap it up". It's possibly better to accurately state the variation you're discussing rather than to call someone a muppet and a patzer when they point out that what you've written doesn't work. Incidentally, what's with this contemporary use of "muppet" as a term of abuse? The Muppets were clever, entertaining and imaginative. And nobody would have insulted Miss Piggy to her face.